The chart makes energy supply decline look gradual. Supply chain disruption due to higher prices and energy scarcity, however, will not be. 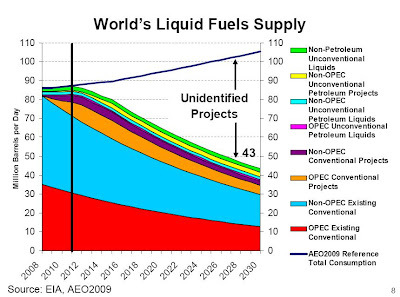 At some point, we can no longer sustain hydrocarbon acquisition as an economic activity. The prices will be too high, and the NET energy return, too low. I'd let those busy-body's over at the UN worry about what MAY happen in the energy markets out past 2032 though I would akin that to crystal balls or predicting the weather. They can't tell me what it's going to do tomorrow, let alone what's something like this out 20 years is going to do. Why worry & bother with the world outlook when it's going to really be the story of the energy have's and the energy have-nots?? The US & Canada are at present two of the energy have's and it looks like that's going to be the story of the next 20 years. How come we can't get a North America centric & relevant view of these energy markets (which I'm sure would look a whole lot better) over the same time frame, instead of these made-to-worry & hard to believe world predictions that seem to be everywhere these days?? Anonymous asks whether we can get a North America-centric view of energy and compare. Well, that's actually what much of the news has been about. Citibank, the National Intelligence Council and the International Energy Agency have all been played up in the media as having "predicted" that the United States will become "energy independent." When the public hears "independent" they think that means "cheap." But oil is a worldwide market and no matter what happens, we in the United States and Canada will continue to pay the world price (adjusted for shipping costs). The idea that the United States will become energy independent is doubtful given the distance between current consumption of crude oil proper and our production. Production is running at about 6.2 mbpd while consumption consumption is running at about 14 mbpd (once you exclude the gasoline and other products that we export to others which we make from imported oil). Yes, U.S. production will probably rise from here. 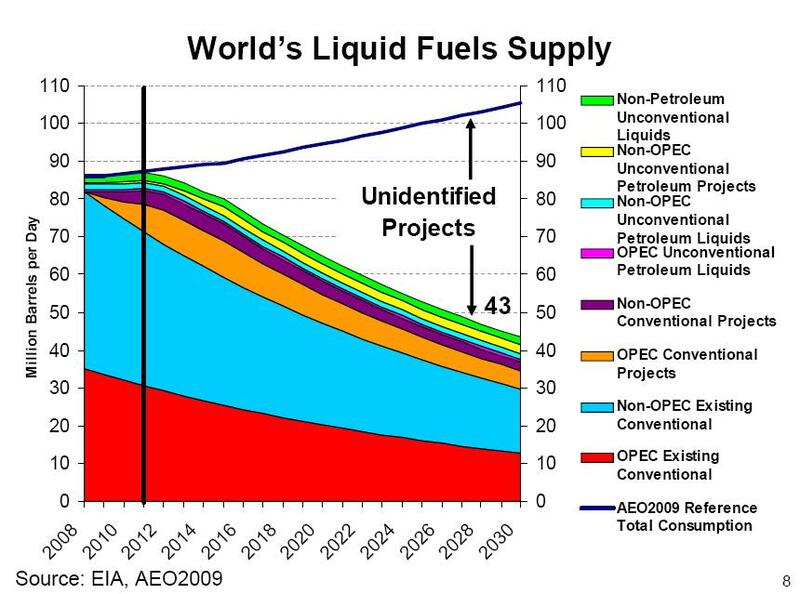 But then, given the high decline rates of tight oil wells, we'll reach a maximum and then decline again. But none of this solves the world dilemma regarding oil and it is world production and consumption which matter since we are all linked in one global system. While the chart in this piece is a prediction with regard to production from existing fields over time, it is considerably less uncertain than all the boastful predictions based on little evidence about world production over the same time frame. Historical experience tells us that existing fields worldwide are declining at at least 4 percent per year. And, this chart is based on that historical rate. In that sense, it is a very conservative estimate of decline rates. The cheerleaders for the abundance idea tell us themselves that we will come to rely more and more on resources such a tight oil where well declines rates are currently averaging about 42 percent per year in the Eagle Ford and 38 percent per year in the Bakken, the two main producers of oil from deep shales. That kind of decline rate is going to make sustained large increases in oil production in the United States difficult to maintain. Yes, the above chart is designed to get people worried. They were told not to worry in 2000 by all these same people and we ended up seeing oil reach beyond $100 a barrel where it stands today in Europe, which represents the true worldwide price and tells us what consumers are actually paying for finished petroleum products. And,these same people did not anticipate that production of crude oil proper would stall out in 2005. We should indeed worry if these people who couldn't get their long-term forecasts right in 2000 are telling us not to worry now. Rather than despair about a dystopian future where fuel shortage spell austerity measures that make Greece's economic problems look like nirvana, consider that all new technologies come from science. Because a science has not yet yielded a commercially successful technology does not mean that it will not. LENR (aka "cold fusion) is real science. The researchers are invited to American Chemical Society and American Physical Society meetings regularly to discuss recent experimental results. The results are conclusive. The effects are real. This is a book comprised of peer-reviewed papers describing LENR results published by Oxford U. Press, sponsored by the American Chemical Society. Perhaps we should be asking 'cui bono' for the status quo, and who would suffer if the problem is solved. Big money wields a lot of power. So any hopes the Yanks will calm down and be less aggressive are probably in vain. it amazes me how people have come to regard science as a magical, benevolent god. science is the accumulation of empirical data. when science predicts doom and gloom lest we change our ways, we run science out of town and proclaim our faith in science-fiction! buy some arable land, learn to live off it, stockpile enough guns, swords, and ammo to defend it. there will be no sudden 'collapse'. we are slowly transforming into a feudal society. at the end of the transformation, brought about by growing populations and dwindling resources, we will all be serfs living with only what is necessary to fulfill our jobs for our corporate or communist lord. The idea that resource scarcity is going to make people cooperate in a peaceful way for the common good clashes against human instinct and historical records. Instead, the rich few will more likely exploit the remaining resource in a more intensive way, then resort to cannibalism. Oh, no wait, that's basically already happening. I know of one gentleman who is very bullish about algae based oil production. You do need large areas of land, but it only has to have good solar access, not arable land and it can use waste or salty water. In his opinion it would amply substitute for all oil fractions adequately. It would allow for a transitional away from oil to a carbon free renewable.